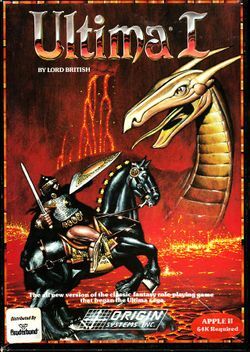 Ultima, later known as Ultima I: The First Age of Darkness, Ultima I: The Original, or simply Ultima I, is the first title in the Ultima series of computer role-playing games. It was originally developed for the Apple II computer, and first published in the United States by California Pacific Computer Company, September 2, 1980. It was later ported to the Atari 400/800 computer and released in 1982 by Sierra Online. In 1986, the game has been completely re-coded by Origin Systems and ported to many different platforms. The 1986 re-code of Ultima is the most commonly known and available version of the game. The game follows the endeavors of the stranger in the task to defeat the wizard Mondain, which involves progressing through many aspects of game play, including dungeon crawling and space travel. The game was one of the first definitive commercial computer role-playing games, and is considered an important and influential turning point for the development of the genre throughout years to come. The story of Ultima I revolves around the evil wizard Mondain and his rule over the kingdom of Sosaria. According to the game's back story, Mondain tried to create an evil gem over 1000 years ago that would have granted him immortality. Luckily, he was defeated by a time traveler before he completed his plan. Since then, Mondain's monsters and beasts have been released upon the land; they kept ravaging the villages and towns of Sosaria and caused most of the nobles to bicker amongst themselves. In order to fulfill what actually happened 1000 years before, Lord British searches for the time traveler who did bring about the wizard's end. This call is answered by the Stranger (the player character). The majority of the game is spent searching for a time machine, and a way to activate it. Four of the lords in the game, one from each realm, hold a gem that will allow the time machine to work once all four gems have been found. In exchange for the gem, the lord will ask the player to complete a quest that involves travelling into a dungeon and killing a specific creature. Once this has been achieved, the lord will hand over his gem. The time machine itself also needs to be found. Purchasing a space shuttle and travelling into outer space is a prerequisite of this: the Stranger must become a space ace, by destroying twenty enemy ships, in order to complete the game. Once this task has been completed, rescuing a princess will reveal the location of the time machine. The Stranger will then travel back in time and face Mondain before he has completed the gem of immortality. The following table is based on the review by Teran. 1980 Apple II The very first version of Ultima. Technically not impressive but historically a ground-breaking version. 1983 Atari 400/800 The only version that is actually based on the first Apple II version and not falling in the time of remakes. Considering its age, it is still an impressive piece of software and highly playable. 1986 Apple II Major re-release under the title "Ultima I: The First Age of Darkness" in 1986. Gameplay-wise it's identical to the old version. Graphically it's slightly better, everything looks more colorful. 1986 Commodore 64 Another fine version. Graphics are neat, the loading times are bearable and playability is very high. 1986 MS-DOS In contrast to the very bad looking MS-DOS versions of Ultima 2 and Ultima 3, they used the 16 color EGA-palette for this conversion. The result is a very good looking version. Since there are no loading times at all, the gameplay is considerably faster than with the other homecomputer versions. NEC PC-8801/9801 These versions were released by the Japanese publisher Pony Canyon. Besides Japanese translation, some enhancements in the graphic department and some music, they are very similar to the remake version for western homecomputers. 1992 Apple IIGS This version features better graphics than any other Ultima 1 version (with the exception of the Japan-only versions) and a full musical score. This page was last edited on 21 August 2018, at 02:33. This page has been accessed 12,194 times.